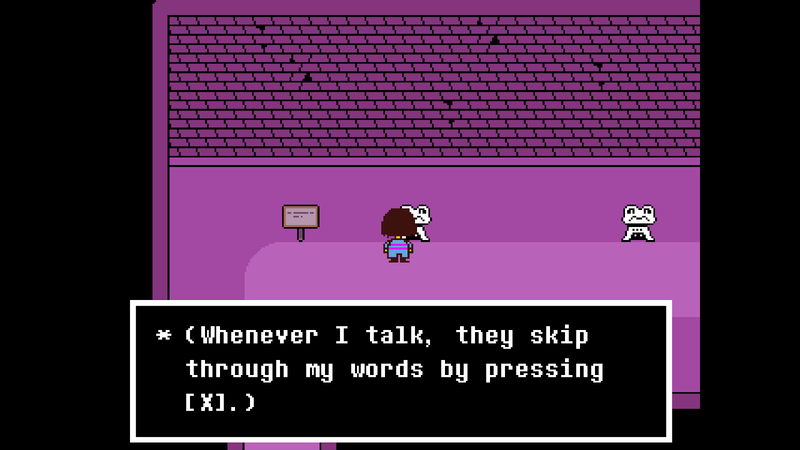 Undertale is a hard game to talk about. I mean, I can talk about the game all day, like how the atmosphere is quirky yet dark, how the characters are varied and relatable, and how amazing the soundtrack is. But given the game’s cult following and the way it has impacted me personally, that can’t be all there is to it, right? 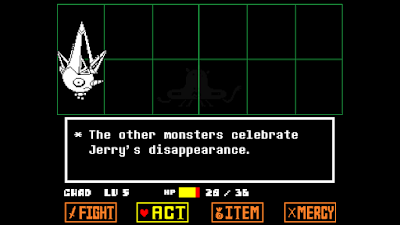 I find it hard to put my finger on the deeper reasons why I loved Undertale. And it’s even harder to talk about the game without spoiling certain aspects for potential players. But I’ll try anyway! For starters, let’s talk about the basics. 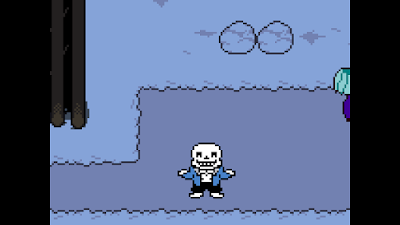 Undertale is a game, and games are built with systems. The combat system combines old-school JRPGs with bullet hell gameplay, and manages to stay surprising and fresh throughout. 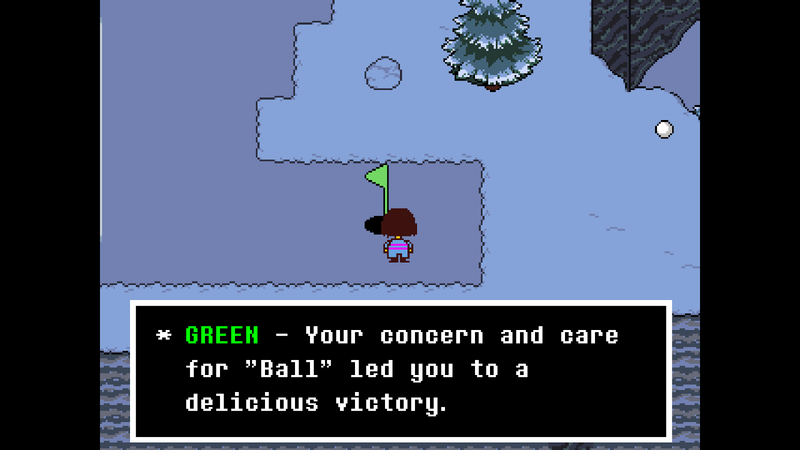 Undertale also boasts an interesting morality system, with radically different stories dictated by your choices. Undertale’s story is great, the vibe is unique, and the lore is pretty deep. There are also interesting and unsettling meta elements that I won’t get into here. These are even integrated into the lore, which is a pretty novel concept. And as mentioned, the soundtrack is really solid. Toby Fox, the game’s designer, is a musician, so the audio was obviously handled with care. 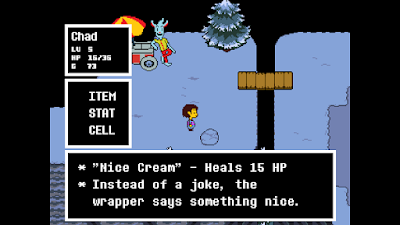 So all these qualities are great, and definitely contribute to the game’s success, but I think the reason I fell in love with Undertale is the way it treats violence and morality. 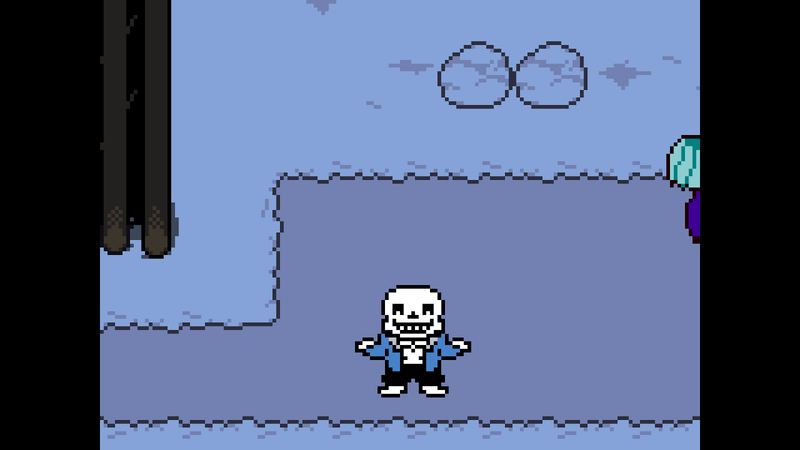 One of the game tropes that Undertale remixes is violence. The media often decries the depiction of realistic violence in video games, but the in-game context and consequences of violence are rarely considered. It's just taken at face value. Look at Grand Theft Auto, for example. You can shoot up the city, murder countless people and be pursued by the police and the military… and get off with only a small hospital bill. This lack of any real in-game consequence almost trivializes the violence, removing any real weight from those actions in the game world. Yes, the violence is nearly photo-realistic, but it’s empty, almost devoid of meaning. Furthermore, in this game and many others, the player has no choice but to participate in violent behaviour, because a) the game mechanics are built around it, and b) it is necessary to progress the story. 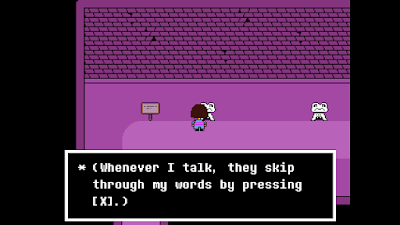 Alternatively, Undertale can be played entirely non-violently. 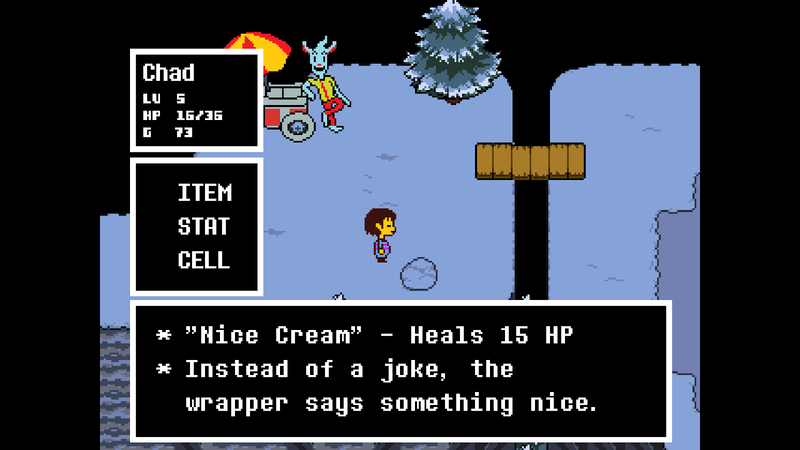 Undertale has an interesting morality system that's actually built into its combat. The game allows players to kill monsters for experience points and gold like a typical role-playing game, but monsters can also be interacted with non-violently. By choosing the Act command instead of the Fight command, players can bypass violence altogether. I was surprised to find myself emotionally invested in these common encounters. Whether it’s complimenting an insecure monster, cheering on a singing monster, or petting a dog in armour, most encounters can be positive ones if the player commits to this play style. 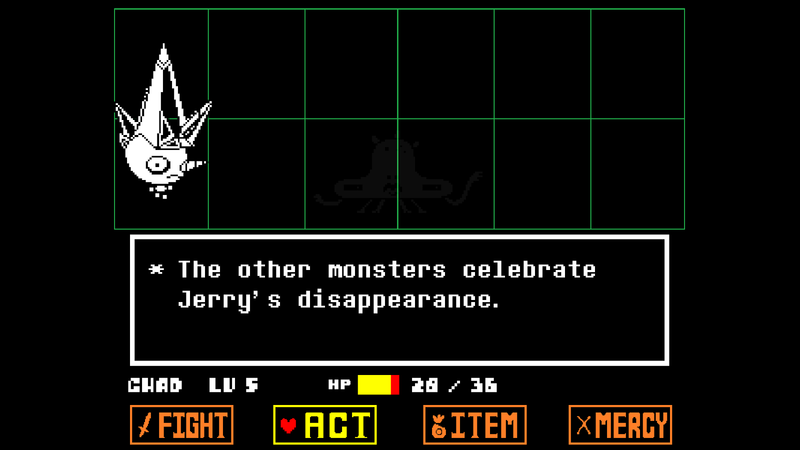 This means that the choice to commit violence in Undertale can be avoided. Violence is even frowned upon by other characters. The consequences to violence are made very apparent, with changes to the world and story. Characters treat you differently. Which totally makes sense. This makes the violence much more realistic, in a way. Don’t be deceived by this game’s minimalist retro aesthetic: as the PBS Idea Channel highlighted in one of their videos, Undertale could be the most violent game of the past year. 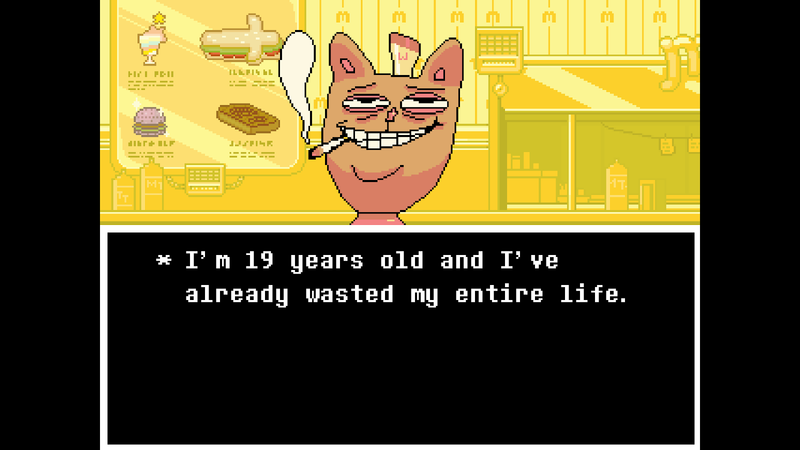 Playing Undertale was just such a great experience. In addition to being well-built and innovative, the game is just so human, sincere, and personal. It’s refreshing to see a game with such unabashed positivity. This is contrasted by the infamous and absolutely devastating “genocide run” that leaves players feel really bad, or simply unwilling to play that version of the game. The game is really shaped by who's playing it. And as you may have noticed, this little indie game amassed a huge cult following pretty quickly. From what I've heard and read, this burst in popularity was annoying to some non-fans, which is understandable given the passion of the fanbase and the difficulty in grasping why the game is widely loved without actually playing it. 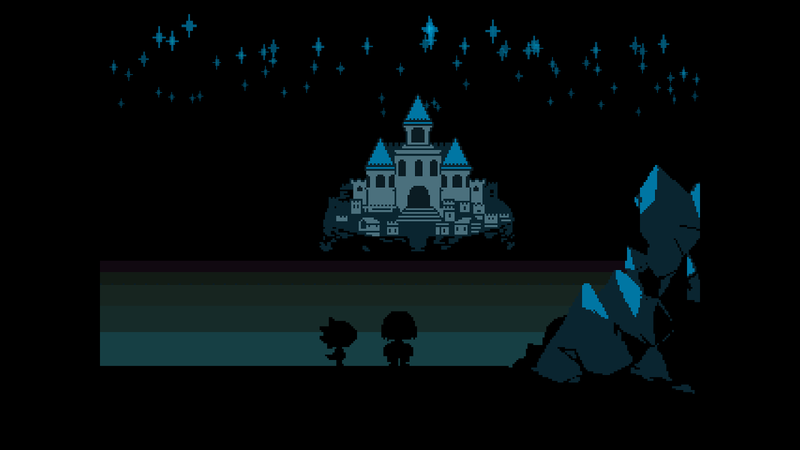 If you’re interested in games that offer more than entertainment, that are emotionally engaging and challenging, be sure to check out Undertale, my favourite game of 2015.